There's only one thing that I don't like about Colette Patterns, and that is that there's not enough of them! Ba-doom Ching! My latest creation is from the Colette Patterns range; the Parfait dress and it's delicious. It features a gathered bust, a flattering high smooth high waist, loose A-line flared skirt, pockets and buttons! 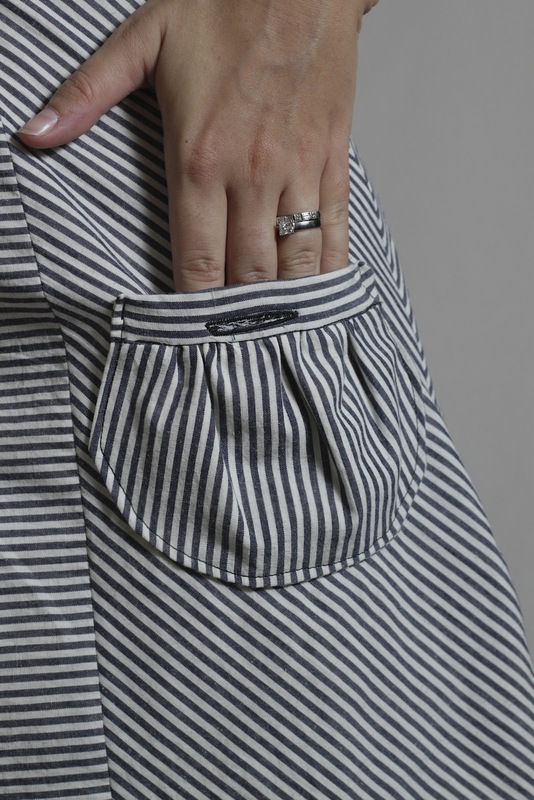 And who doesn't like pockets! Let's be honest! Well actually, I've been known to ignore the pockets on some patterns due to their positioning. 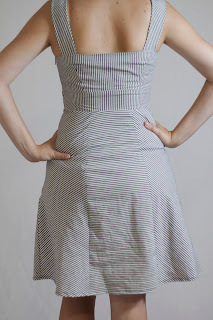 Some side seam pockets can add unnecessary bulk to already bulky areas (pear shape much?) 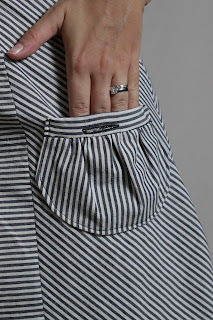 but these fancy pants pockets sit mercifully on the front of the thighs minding their own business. I made the dress out a heavy cotton that I purchased from The Fabric Store and the moment I saw it, I knew I wanted to get fancy with the stripes. I played around with the different directions of the strips to add extra flare to the look. Some pieces the stripes are horizontal, some vertical, some diagonal. See all the different directions? It'll make you go cross eyed, but I find the effect very satisfying. I love the gathered bust shape and the sweet heart neck line. Now I can sense that some of you are jumping up and down on your seats and pointing at your screen so I will come out and say what you've already probably noticed. Yes. The tabs on the shoulder straps are back to front. The tab is supposed to have the button and go behind the strap with the button hole. I accidentally did it the wrong way round so you don't see the pointed detail of the strap. See? The arrow strap is supposed to go on top. Oh well, I still think it looks good so I'm just going to let that one go. I love the high waist which is very flattering to a pear/hour glass shape with the nice flared skirt. It hides lumps and bumps well! Also, because this dress isn't lined, it's quite fast to whip up, and a good dress for beginners. 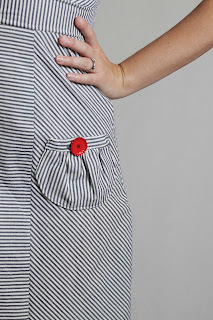 P.s.- how cool are the buttons in contrast to the stripes! I cut the bodice and waist in a six, and cut the skirt from the hips down in a size eight. This is actually pretty awesome for me, as normal commercial patterns the hip size usually needs to be cut more than one size bigger than the waist and torso. I made this dress up in a calico first (good girl Julia!) which highlighted some adjustments that I needed to make on the bust. The centre of bodice, right where is drips down into a V was very gapey on me, so I sliced one cm from the centre fold to remove the excess fabric. You can see on the picture below the slice that I've cut off on the left of the pattern piece. 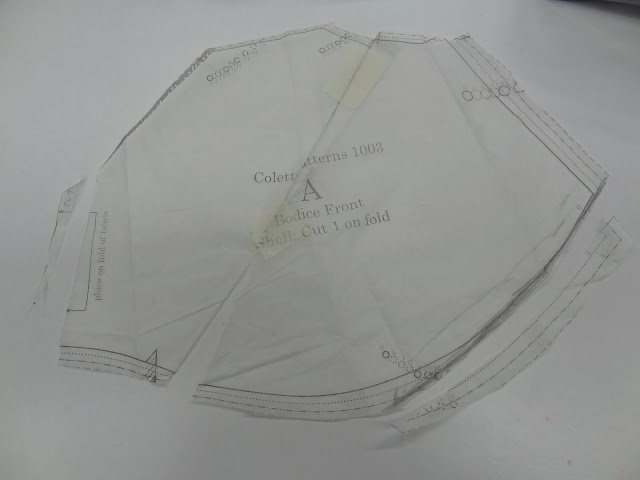 Even though I have a full bust, there was a lot of loose fabric flapping around in the centre of each cup, which wasn't eliminated from the gather stitch below the bust, so I created a dart of about 1.5 cm's on the pattern piece to reduce the volume, which you can see in the photo below. Lastly, the bottom of the bust pieces sat way down lower than where my bust started (my bust starts pretty high on my frame) so I reduced the curve under the bust by about two centremetres. You can see where I've cut it out in the below photo. The result was a nice fitted bodice. Everything else stayed the same - minus my button hole/strap blooper. It was a pleasure as always making a Colette pattern. The packaging is detailed and injected with love and the instructions were intuitive, instructive and caring. 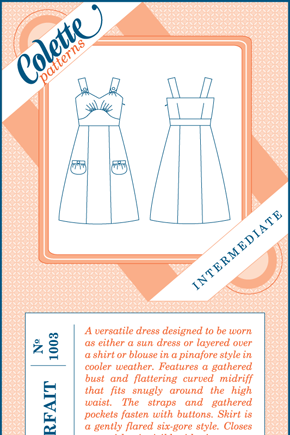 Another great dress from the Colette patterns range! And I do love a good stripe print. What a fun dress you have created!!! Love the placement of the stripes - very flattering on you.... as for the tabs, it called creativeness (not a mistake)!!! Super cute interpretation of parfait pattern! @Doobee64Ha! You're awesome, I am going to use that from now on! Creativeness! Thanks for your lovely comment. This is so cute. I would never have looked at that pattern and thought it could turn into that. I'm convinced I need to make this dress now. Thanks for the inspiration! Julia, I love this creation of yours. It's looks fantastic. I haven't done this dress yet but on Colettes always have to adjust bodice pieces as they are always gapey. Totally worth the effort though, as Colette Patterns are amazing. Great fit and an awesome fabric/button choice! I love it! I never thought I liked the parfait but I absolutely love this. It is of the best dresses I have seen. 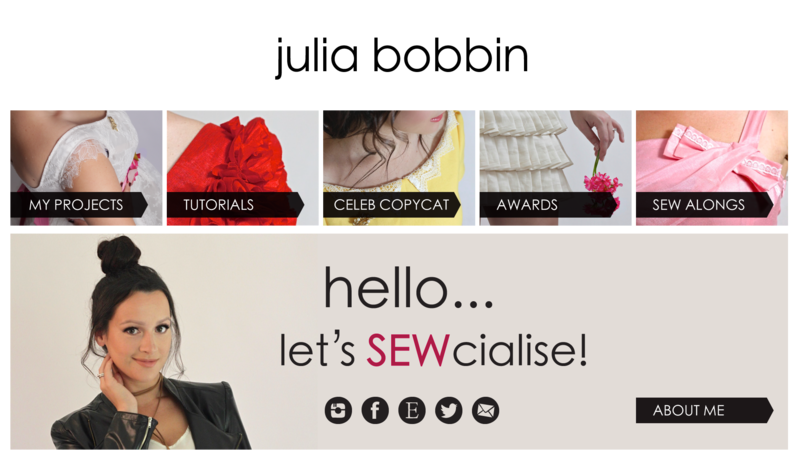 Would you like to post your project on my Sew & Tell linky? Its geared specifically for sewing projects ! I love this! Playing with the grain/stripes really makes the lines pop. I found your blog recently through BurdaStyle and have really enjoyed looking through your projects. As always, awesome! I love the stripes! 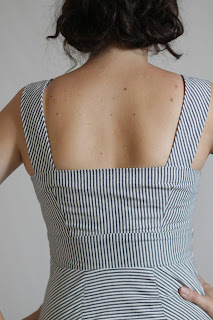 Thanks for showing your bodice alterations - I like the Colette patterns but I know they tend toward the large-busted and I am basically no-busted, but it's helpful to see how you adjusted it down a bit (my alteration would have to be twice that, of course, but it's a good start). How cute, you look smashing! Thanks for mentioning me, I was wondering if you had seen my version... How weird, two twin Parfait dresses on opposite sides of the world! That looks fabulous - love all the different stripes! The button/strap blopper wouldn't be too difficult to fix. 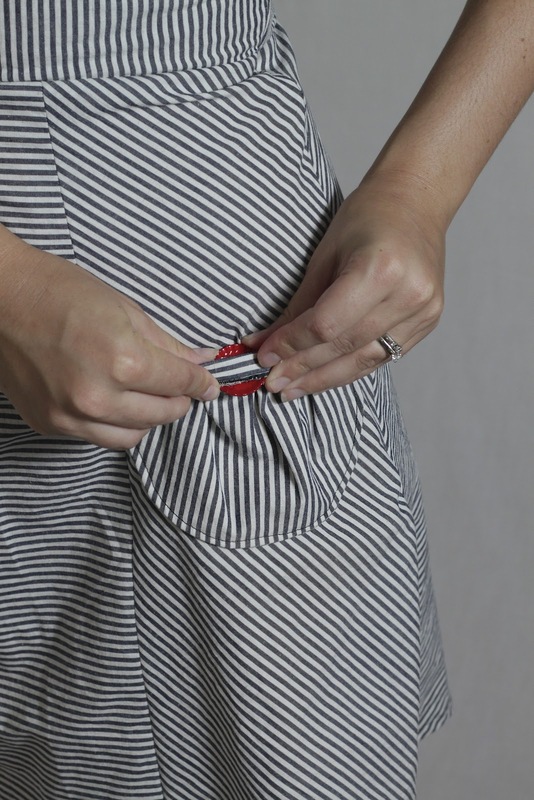 Either make two more little tabs, or just whip the buttonholes closed, and make a buttonhole on the top strap. It would look better with the pointy bit facing down y'know. Otherwise PERFECT!!! Merry little CHristmas to you, too - I hope Santa brings you heaps of material and patterns! Love the use of the stripes, a very cheeky dress. @Sew Country Chick Oh thank you so much and what a great idea! 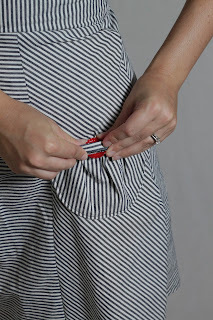 I just posted my project under your Sew & Tell linky. Thanks again! @Paunnet I know it's crazy, and I LOVE your parfait it's amazing! Maybe the common thread (mind the pun) is the Italian heritage! - You seem rather comfortable altering patterns. Is this something you learned by trial and error, or did you take some course or read a book or sth? - I find it impossible to make anything that is not for myself. Since I lack the skill of sizing I need to be able to constantly try it on. Do you have the same problem? If not, how do you do it? Adorable. Love your version. The red buttons really make it! @Joost Joost you are wonderful thank you! I have the same 'size fear' as you do as I've never actually attempted to sew for anyone else. A lot of my fitting techniques are from trial and error, and a lot of them are getting easier to do because with my shape it always seems to be the same alteration to each pattern that I come across so I don't have to try and work out too much maths anymore. Generally I make up new patterns or creations in a calico/muslin first so I can see what the fit issues are, and then I pin all the bits that are too big and mark them in pencil on the muslin. Once I've taken it off, it's just a matter of transferring those markings onto the pattern pieces. I have certainly made a lot of mistakes with this before, but it's getting better. Thanks so much for your comment and Happy 2012 for you also! Wow, you're of Italian origins? Cool! Wow, I love your version of Parfait! The stripes look fantastic! Goorrrgeous! wow love that dress! 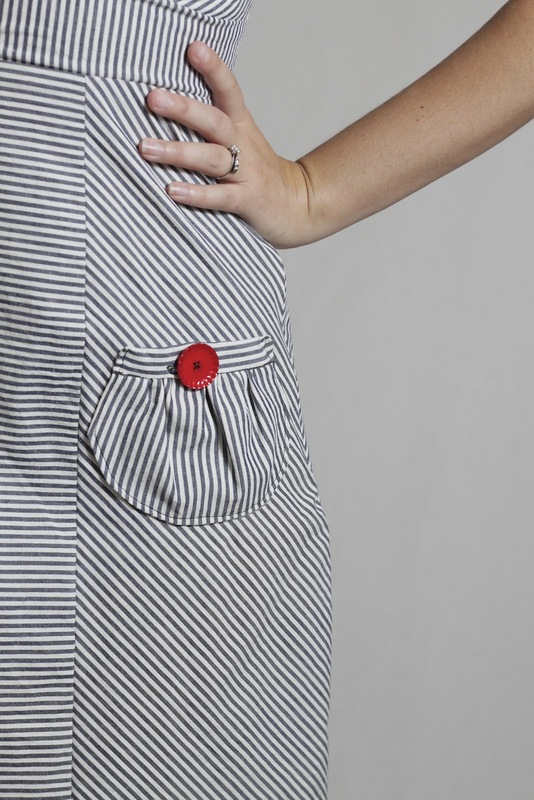 love the navy and white stripe with the red buttons and you've made a fantastic fit. What an utterly adorable dress! I love it!